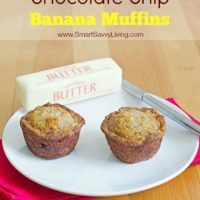 This Chocolate Chip Banana Muffins recipe is so good, it just may be the last one you ever look for! What is it about men and bananas? Plain bananas, banana pudding, banana bread…I’ve never met a man that didn’t love all things bananas. Me? I think bananas are okay as long as they are in something. The taste is just okay and sometimes when I try to eat them by themselves the texture gets weird and I just can’t finish them. However, I will totally admit I can eat the heck out of this Chocolate Chip Banana Muffins recipe. Mr. Savvy often stops by Trader Joe’s and buys 2-3 bunches of bananas hoping to have enough leftover for one of his favorite recipes that I make: banana bread. Sometimes I’ll make it plain, with chocolate chips and/or as muffins. Since I’m bananas about him (go ahead and roll your eyes, I’ll wait), I decided to mix up a batch of this chocolate chip banana muffins recipe for Valentine’s Day a couple weeks ago. This Chocolate Chip Banana Muffins Recipe is really simple and I’ve made it several times over the past 10 years or so without it ever failing. It’s so good you just may never want to try another recipe again. I know I haven’t. It’s also pretty versatile as you can make it as a loaf, muffins or even cake and add different flavor chips, nuts (I never have as the Mr. is allergic) and I think it would also be great with peanut butter or maybe even a chocolate version or Nutella. I make this recipe so often that I bought 2 gadgets to make it even faster and easier: my Oxo Good Grips Large Cookie Scoop for the same size muffins and no mess and my Wilton muffin pan that’s non-stick and has held up for 3 years now without peeling. I never even use muffin liners and nothing has ever stuck, which I consider a pretty awesome feat! The bread has a wonderful texture that is moist and flavorful and can be eaten as is or with butter and holds up beautifully when toasted, grilled, or made into french toast. The main 2 things to keep in mind to make this recipe as awesome as it can be is to first make sure your bananas are super ripe for a lovely banana flavor. I mean just as you think they’re ready to toss in the trash because the banana peel is turning brownish-black, give them another day ripe. The bananas inside will be just fine and you’ll love the extra flavor in the final product, trust me. Secondly, don’t over bake the muffins as that’s the #1 reason for dry muffins/breads. However, even if you do over bake it, it can be saved with a glaze, icing or by grilling it and serving with ice cream or having french toast. 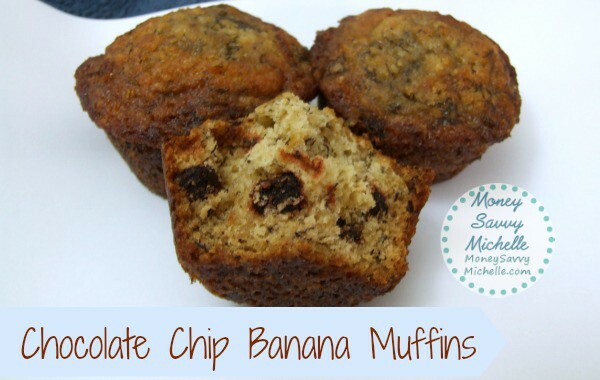 This simple yet delicious chocolate chip banana muffin recipe will be the last you ever need! Preheat oven to 350°F and flour/grease or spray with non-stick spray 2 12-cup muffin tins. You can also use liners, if desired. In a medium-sized bowl, whisk together flour, salt, baking soda and chocolate chips and nuts, if using. You can add chocolate chips and nuts at the end if you want some muffins without them, but coating in flour helps to evenly distribute them and keep them from sinking to the bottom. In large bowl, combine butter (you can use softened or melted - the muffins turn out great with either), sugar, mashed bananas, eggs and vanilla until well blended. You can do this by hand or with a mixer. Stir flour mixture into wet mixture in 2-3 batches until well blended. However, be careful to not over-mix or your muffins may have tunnels. You can do this by hand with a wooden spoon or with a hand or stand mixer. Pour evenly into 2 12-cup muffin tins. I like to use a large scoop as I do for cookies for equal-sized muffins. Bake for 12-17 minutes until dark golden brown - stick a toothpick in the middle and it should remain clean. If your oven has a hot spot, you may want to rotate pans halfway through. Remove from oven and let cool in tins for 5 - 10 minutes on cooling rack. Take a spoon or knife and carefully lift muffins up and set them on their sides in the tin (or right side up on a cooling rack) until completely cooled. This is so the bottoms don't steam and stick to the pan. Store at room temperature in air-tight container or bag for up to 3 days or longer in fridge or freezer. This recipe can also be made into a 9x13 cake, varying muffin sizes, or 2 loaves - just alter the baking time as needed. 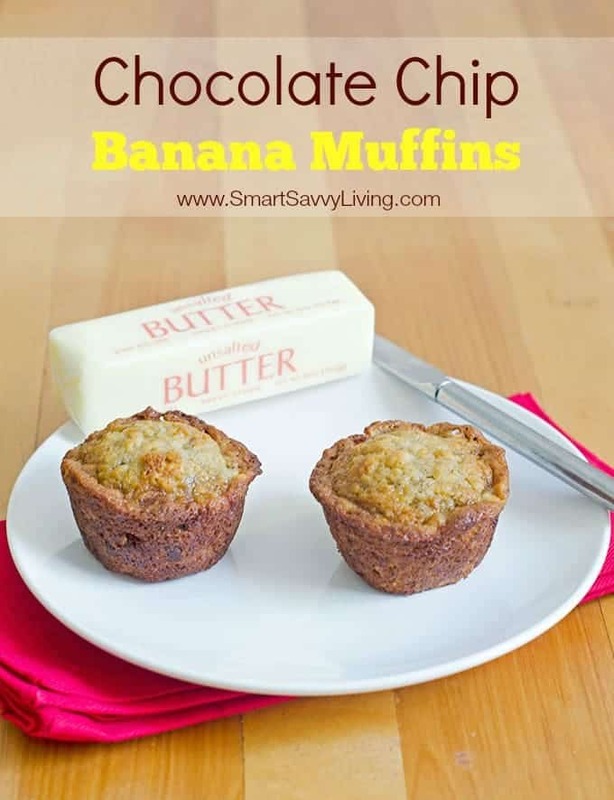 I hope you enjoyed this Chocolate Chip Banana Muffins Recipe – be sure to check out or other recipes for more ideas! Actually I love chocolate and bananas more than he does but he sure loves muffins!Those sound great! Your muffins sound delicious, I love banana and chocolate together! I love this recipe! Not really bad for you either!! Thanks for sharing. My sons love bananas, so I’m sure these would be a big hit! Thanks! They look yummy! Pinned for later, thanks!